No resort fees! Staff is very friendly, and helpful, excellent food options. The gentleman who checked us in gave us a complimentary upgrade to the South Tower. Unexpected and very welcome. We always enjoy our time at Four Queens. The staff was helpfyl. House keeping associate are very friendly. Food in restaurants great. No resort fee / reminds me of old school Las Vegas . Everything was fine with our stay. The device was great. The location was good but the music was to way to loud. Good place to gamble right in the middle of Freemont. Drop stuff off at the room and get right back out there. Excellent service by all staff. All were very friendly and professional. Elevators were readily available at all hours. All food locations were excellent, very friendly hosts. Great location also. Very convenient location to Fremont Street Experience. Of course that also means that the experience (and its noise) is convenient to you. Hotel provides earplugs in room. Parking is easy, and there is an Avis desk in the hotel. The rates are great but it is an older hotel. The rooms are clean. The convenience to everything on Fremont was worth everything. It is loud at night but you are on a very busy area, and you do get used to it. I would stay again. The queens is always great! Plus no resort fee can’t beat that!! I loved the security. They saved me from a weird guy before I had to ask. Great Bell hop service. Great check in. wonderful vallet. 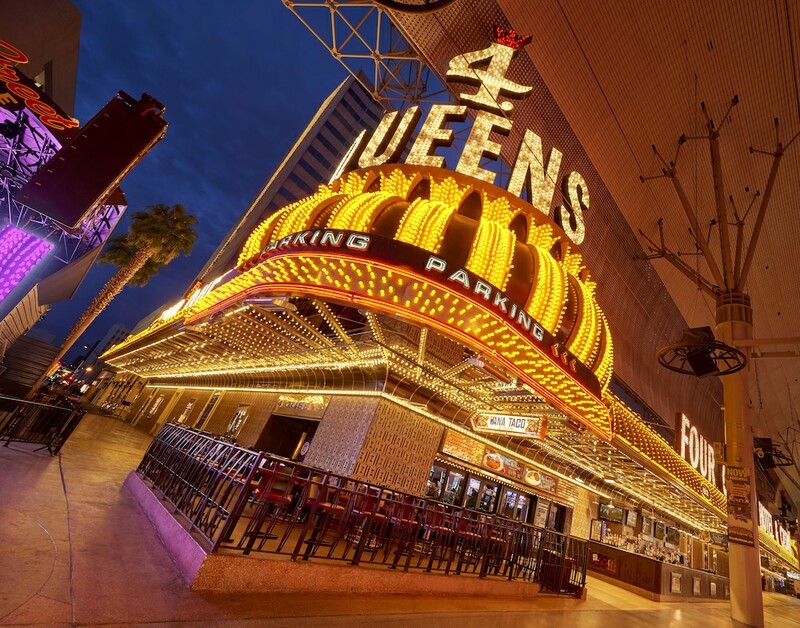 Located in Downtown Las Vegas, Four Queens Hotel and Casino (No Resort Fee) is adjacent to Golden Nugget Casino and within a 5-minute walk of other popular sights like Fremont Street Experience. This 694-room, 3.5-star hotel has 3 restaurants along with conveniences like a casino and an outdoor pool. This hotel is home to 3 onsite restaurants, perfect for a quick bite to eat. Savor a meal from the privacy of your room with room service, or get a pick-me-up at the coffee shop/café. Cooked-to-order breakfast is offered for a fee each morning from 5 AM to 1:00 PM. A flat-screen TV comes with cable channels, and guests can stay connected with WiFi. The bathroom offers hair dryers and free toiletries. Other standard amenities include a coffee maker, a safe, and an ironing board. Guests staying at Four Queens Hotel and Casino (No Resort Fee) enjoy access to a casino, an outdoor pool, and free WiFi in public areas. Valet parking is available for USD 3 per day. Multilingual staff at the 24-hour front desk can assist with dry cleaning/laundry, concierge services, and securing valuables. Additional amenities include conference space, a business center, and a ballroom. Cooked-to-order breakfast is served daily from 5 AM to 1:00 PM for a fee. Magnolias Veranda - Restaurant serving breakfast, brunch, lunch, and dinner. Kid's menu available. Open 24 hours. Hugos Cellar - Fine-dining restaurant and bar serving dinner. Chicago Brewing Company - Pub serving lunch and dinner. Subway - Delicatessen serving breakfast, lunch, and dinner. Noble Romans Pizza - Restaurant serving lunch and dinner. Recreation features at Four Queens Hotel and Casino (No Resort Fee) include an outdoor pool.